Aycliffe Sports Club continued their good start to the season with a draw against Gainford Cross Keys, which was played inside Moore Lane Park. 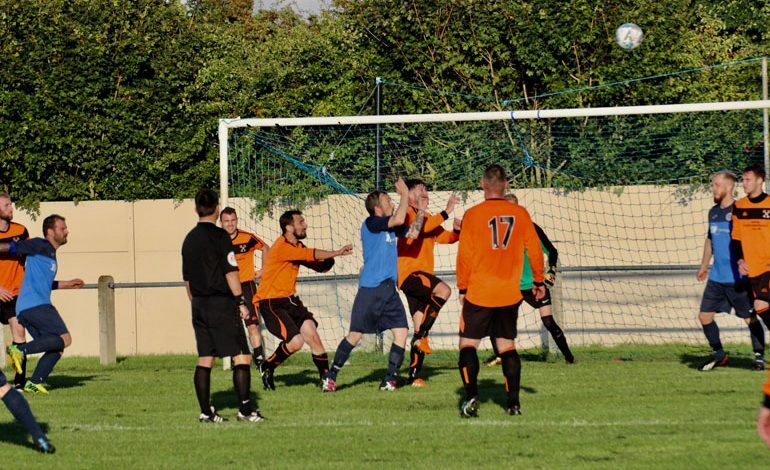 The large pitch was a leveller for both sides and it took until the 30th minute for the deadlock to be broken, when Gainford centre forward Alan Haycock broke through with a suspicion of offside to slot home past keeper Craig Hannant. The home side showed their resilience and were level on 35 minutes when a long cross field pass from Stuart Cameron found Kyle Allen who stabbed the ball home for the equaliser. With only five minutes left before the break, a neat one-two released Stu Cameron to put the home side in front going into the break. On 70 minutes Gainford grabbed the equaliser after a long ball into the box was knocked into the net and just a few moments later the away side went in front when the Sports Club failed to clear the area. The home side had to dig deep and equalised through Stu Cameron after an unselfish Kyle Allen cut the ball across for him to shoot into an empty net. Gainford were not to be outdone and caught the home side off guard to race through to make it 4-3 on 83 minutes. Kyle Allen made sure the Sports Club grabbed a point with an equaliser on 87 minutes, notching his second of the game. The Sunday game at home to Bishop Auckland Bay Horse was another tough game. The Sports Club started slowly and were two goals down within the first 10 minutes. Both goals were invited on by themselves with the first goal coming from a high ball into the box with no-one taking ownership and the ball was easily tapped in. The second was a mistake from the homeside keeper who gifted the opposition with their second. Two quickly forced substitutions however helped to change the game. Injuries to Anthony Campbell and Sean Johnson saw Jimmy Cameron and Adam Gittins come on and the home side quickly started to get to grips with the game. Kyle Allen’s long-range effort deflected off Jimmy Cameron and past the Bay Horse Keeper to make in 1-2. A long through ball from Ryan Stonehouse found Allen who broke through and slotted home to equalise. The second half was an even affair but it was Jimmy Cameron’s second goal to make it 3-2 that killed the game off. This week is derby week again as the Sports Club play The Gretna at Moore Lane. Previous article What does Brexit mean for me?